With less than 24 hours remaining to finalise those teams, here’s all of the community Round 1 tips for the McDonald’s Official World Cup Fantasy game. Before reading the Round 1 tips, make sure that you join the community in our McDonald’s World Cup Fantasy Football League. The 1st place manager will win a replica World Cup shirt of their choice. 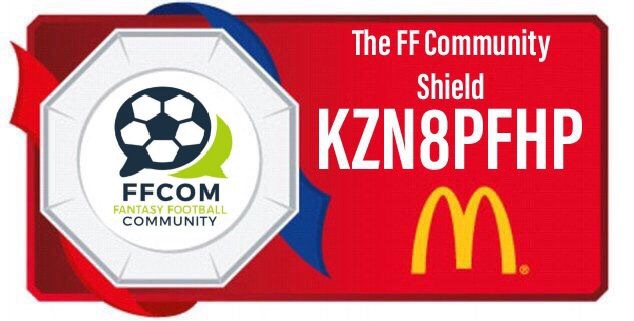 To be a part of the FF Community Shield, manually enter our league code KZN8PFHP, or click the graphic below. If you’ve no idea where to start, check out this ultimate How to Play Guide, brought to you on Fantasy Football Pundits. There’s plenty of Round 1 tips for setting up your initial squad. The team at Fantasy YIRMA have produced small instalments of the Bang Average podcast, previewing each of the groups. You can start with their Group A offering right here. If you’ve left it late to be super organised, Strategy FPL have created a fantastic spreadsheet tool via Google Drive, to help plan your squad. There’s also a helpful video guide, to get started. 📽️ Tutorial on the FREE W.C Spreadsheet. Google Sheets/Drive required for mobile. If you’re knowledge of worldwide football isn’t as strong as FPL, then check out this video from FPL Updates, which has all the predicted line ups. Their squad prices are also included, which is extremely useful! For a comprehensive guide to set piece takers, look no further than Clarke Hutchinson. He’s done all the hard work so you don’t have to. Including players on this list could prove very wise. Currently working on an exciting project, one task being to analyse OPTA statistics & the match history of 32 nations to create this table. FPL Coach has produced an informative article on potential defensive targets, for the Round 1 Tips. Marcelo has the highest ownership in the official game. Check it all out on Daily Strikers. 📝 Fantasy World Cup – defenders to target@FPLCoach picks 3 best defenders for your fantasy squads, and also one which promises interesting value. Be sure to check out my article for FPL Bet, to help decide on captain candidates for the Round 1 tips. With the option to move the armband on a daily basis, it pays to be organised in this area. The fantasy football hub team are on the lookout for bargains in the game, including players priced at 4.0 million who may start. There’s some useful strategy talk in here too. #WorldCupFantasy underpriced players, 4.0 defenders, wildcard timing and more. Inferno Six returns to the site, with a comprehensive analysis of the group stages and respective fixture difficulties. This could help you decide on your strategy for the wildcard and boosters. Ben Crellin is back, looking at implied betting probabilities for teams to keep a clean sheet or score 3+ goals. This could help in firming up your defensive line up and potential captain targets. The team at Worldwide Fantasy Club, have created their watchlist with plenty of Round 1 tips. Find out the potential bargains they have uncovered and the players you can’t go without. With many classy wingers listed as forwards in the official game, managers are going big in attack and defence, with cheaper players in midfield. FPL Fraud lists some potential options. FPL Tips returns, with more fantastic graphics, to preview his Round 1 team on YouTube. Find out how his team lines up, plus which booster will he have in play for the opening games? The Always Cheating Podcast is back for the summer, with their take on the best fantasy assets from Groups E to H. There’s plenty of discussion on England’s chances, among others. It’s been a damaging time in the lead up to the World Cup. As always, Ben Dinnery has all the injury news. Salah is back in training and Sidibe is out of the Australia game. Fantasy Bet have provided access to a 48 page magazine, with all the information you’ll need to set up your World Cup Fantasy squad. Best of all, it’s completely free. Be sure to check it out. Some early team news has been circulating on Twitter, including Argentina and France. There could be some budget players afforded an early start, which could help fantasy managers balancing a budget. There are many places like this FanDuel site you can go after the games to voice your opinions and give your view on any controversial decisions. People can read your sports content and get a better understanding on anything that happened in the game. If you’re interested in playing World Cup Daily Fantasy Football with us and many other community members this summer, please download the FREE Starting 11 app today by clicking the banner below – available on Android & iOS. Check out our World Cup Daily Fantasy Preview for your guide of how to play!